Taking a page from our buddy over at Fall River Eats, Mom and I decided to visit Rosaria's Diner, which is located only minutes from our home. We've driven by this popular breakfast spot for years, but have never gone inside. Since Fall River Eats gave it such high marks, Mom and I decided that we just had to give this place a shot. 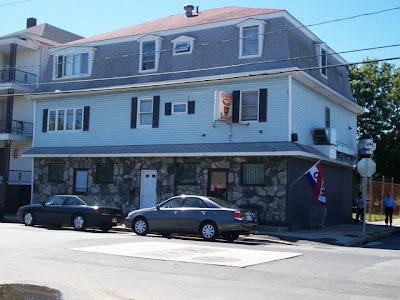 Although Rosaria's does not have a parking lot, we were able to find a space right on the side street. We entered the restaurant at about 11:20 a.m.
What an adorable place! When we first walked in, we saw a bar/counter area. A young lady directed us to the dining room where we were told we could sit anywhere we wanted (Mom loves that). We picked a table located just in front of a large cooler filled with different beverages like juices and sodas. Mom and I noticed that the plastic-covered Rosaria's menus were already on every table, so there was no need to wait for them to be brought over. A friendly waitress came over and asked us if we would like coffee. Mom said yes, but I opted for iced coffee. The waitress soon returned with an iced coffee in a large Styrofoam cup. Using the sugar and milk on the table, I was able to make the coffee to my liking. Since we'd never been to Rosaria's before, Mom and I needed a few minutes to look over the menu. When we were ready to order, the waitress returned to our table with notepad in hand. Mom ordered three pancakes, and since you can order them individually ($1.60 each), she chose a peanut butter, a walnut, and a chocolate chip filled. The waitress said something like, "Boy, that sounds good." It certainly did. She also ordered a side of bacon ($2) and a small orange juice ($1.35). I almost ordered the same thing (minus the bacon and OJ), but was more in the mood for something meaty. 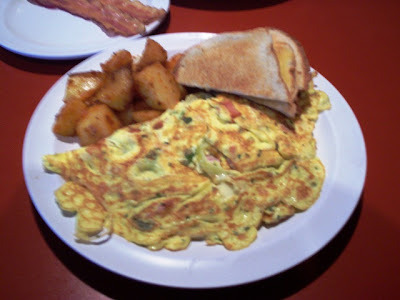 I chose the Portuguese omelet ($4.75) which came with a side of home fries and toast. We put the menus back in their holder on the table and took a look around the dining room. It was very, very clean. That's always the mark of a restaurant owned by people of Portuguese heritage. They really know how to make a great presentation. Aside from the cleanliness, the dining room was decorated with comfort in mind. There were no booths, but each table was situated away from the others so that each party could have a bit of privacy within a small area. The reddish-mauve walls and the dark wooden rafters made us feel cozy and relaxed. Restrooms are located just off of the dining room, and there was a large whiteboard against the side wall that featured all of the daily specials. A small television sat upon the drink cooler, and the walls were decorated with cute country knickknacks. This restaurant is very easy on the eyes, especially when most of the diners' eyes have not fully opened yet. It did not take long for our food to arrive. Actually, we had only been waiting a few minutes before we spotted our waitress coming over. Both plates looked and smelled fantastic. Mom said that she made a very good choice by picking the peanut butter/walnut/chocolate chip combo. The flavors really worked well together. All three pancakes were packed with their special ingredient and were very tasty. For big pancakes, they were very light and fluffy. Mom's bacon came in three slices and each was very crisp and meaty. She also enjoyed her coffee, but was still waiting for the orange juice. My omelet was excellent. Not only were there several varieties of peppers mixed in with the eggs, there was also some chourico and cacoula bits sprinkled in. The omelet was very hearty and was cooked perfectly. My white toast was great and the home fries were thick and flavorful. I'm just sorry that the picture did not come out as clear as I thought it would. When our young waitress appeared to ask us how our meal was, we told her that everything was lovely. Mom asked if she could have the orange juice that she ordered, and the waitress apologized because she'd forgotten to bring it. The dining room had started to fill up with people who were coming in for lunch, so the mistake was easily understood. The prices at Rosaria's are extremely reasonable, especially for the amount of food you get. Breakfast menu items include egg entrees ($2.90-6.45), breakfast sandwiches ($1.95-$2.75), three egg omelets ($4.15-4.75), pancakes ($1.30-1.60 each), French toast ($1.10-1.45 each), waffles ($1.50-2.25), cereals and fruit bowls ($1.50-2.50), toasted/grilled sides ($.90-1.30), and various other side dishes including Egg Beaters, Spam, steak, and chourico ($.20-2.95). They also offer a "big" and "little" breakfast. The big breakfast ($9.25) consists of two pancakes or French toast with two eggs, two meat choices, home fries, and toast. The little breakfast ($6.85) comes with one pancake or French toast with two eggs, one meat choice, home fries, and toast. 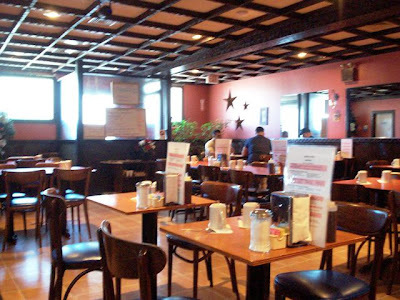 For lunch, Rosaria's serves items like grilled cheese ($1.95), chourico and chip sandwich ($3.50), a hot dog ($1.75), pastrami ($3.50), and other sandwiches all served with chips and pickles. Other items include grinders, wraps, and clubs ($4.15-5.50) like the seafood salad, chourico and pepper, bacon burger, tuna melt, and cacoula. Soup options ($1.90-2.75) include chicken, kale, minestrone, and clam chowder. Don't forget to check the list of daily specials offered at Rosaria's, but I doubt that any meal here will cost over $10. Like I said, very reasonable. It was only after we left the restaurant and looked at our notes that we discovered that the bacon was left off of the bill. Mom and I are all for free food, but we hope that it did not have to come out of the waitress's pocket. She really did an excellent job. We left $18 for her (including 20% tip) and proceeded to leave, but not before stopping by to see a friend of mine and her mother who had come in while we were eating. When their food came, both plates looked great. We knew that they would be in for a good meal. 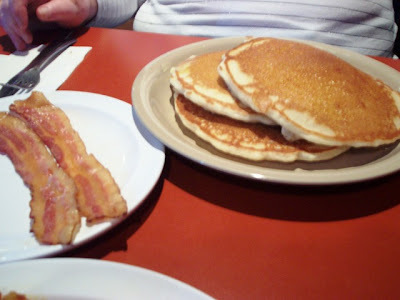 Going out for breakfast is one of the things that Mom and I don't do often, but always enjoy when we get the chance. We are so glad that Fall River Eats turned us on to Rosaria's. I can't believe that Mom and I haven't been before, but what else is new. We always visit a restaurant years after it's been around. Years. We may be newcomers, but we'll definitely be making many more visits back to Rosaria's. 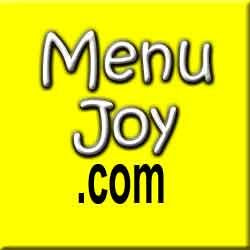 It's the perfect hometown, good food, great prices restaurant complete with a great staff and a loyal customer base. It doesn't get any better than that. 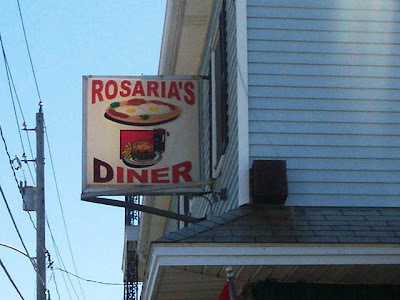 Rosaria's Diner is open from 5:30 a.m. to 2:30 p.m. Monday through Friday, and 5:30 a.m. to 1 p.m. on Saturday. The restaurant is closed on Sunday.